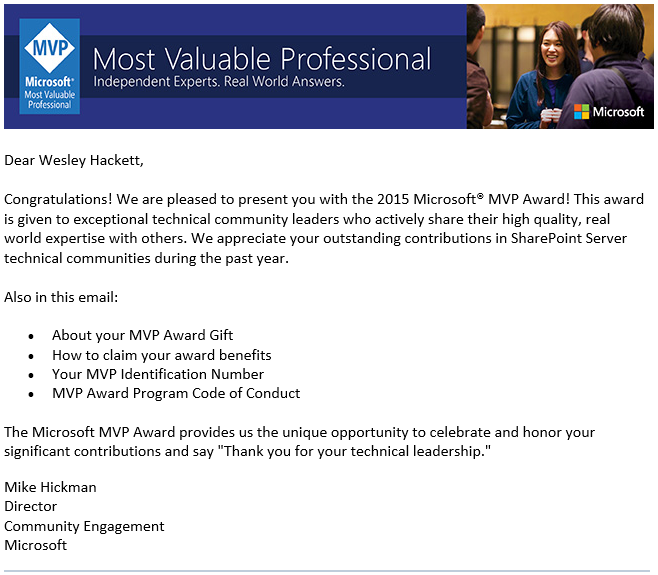 I’m happy to announce that I’ve been awarded Microsoft MVP 2015 for SharePoint Server. 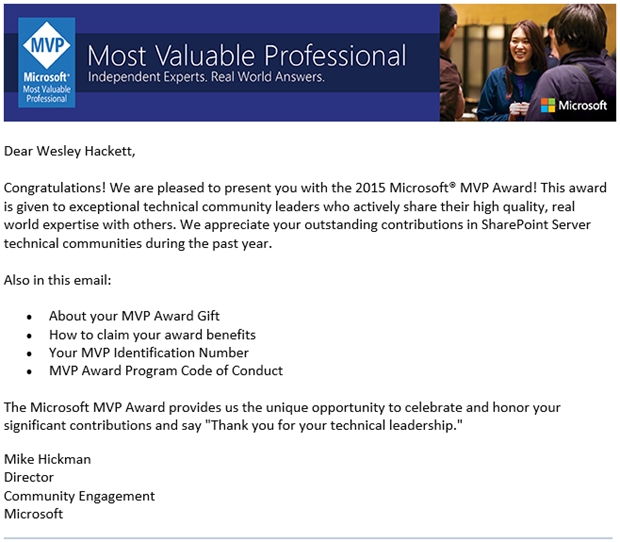 This is my third year as a MVP and it continues to be an amazing privilege to be recognised for my continued contributions. October 1st is one of the those days like any other until about 3pm UK time when every Hotmail email notification brings with it equal measures of excitement and nervousness . Once the email below arrives it’s time to crack on with even more amazing new things. The past year has been one of many new opportunities and many great exciting new technologies. Those who have supported me deserve a special mention. My little boy and girl who don’t quite understand SharePoint yet, but definitely give me all the reasons I need to keep trying. 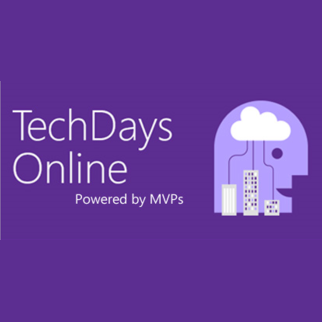 Microsoft DX for inviting me to speak at London Technology Week about the Office 365 Unified API. It was a real pleasure presenting on Microsoft’s behalf. The event organisers for SUGUK, Evolutions London (Steve Smith and Combined Knowledge, Paul, Ben and Nigel) for providing me opportunities to present and be part of the event teams. Microsoft peeps like Chris Johnson for his invaluable help, Jeremy Thake for his technical input, Dana Wikan for sorting out a number of important things.